Living in the Tucson area I can say that it has been quite awhile since I have visited a Nello’s (they don’t have one in Tucson) but a recent trip to the Phoenix area brought back the memories. Just walk into the Nello’s on Warner Road in Ahwatukee and you get a feeling that the folks operating this restaurant are true to the Nello’s of old out of New York. I do believe that this location is the last in Arizona to actually stick to the requirements set out by the Nello’s franchise when they entered the Arizona market. On this visit I did skip the pizza (it was a work lunch and pizza is hard to manage sometimes) but I gave one of the specialty sandwiches a shot and was happy I did. 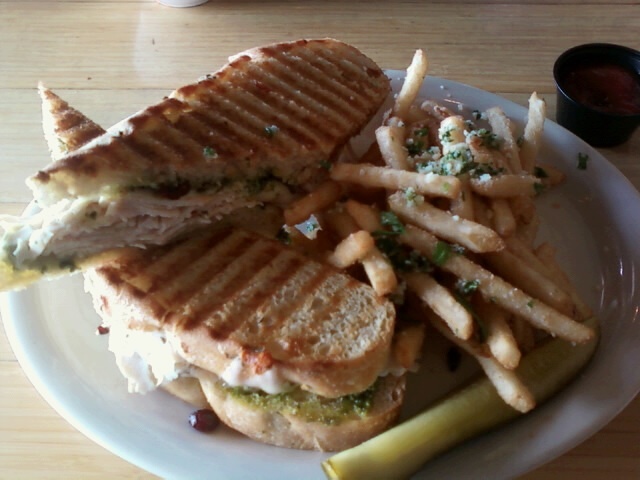 The sandwich of choice was the Turkey Pesto Grilled Panini. 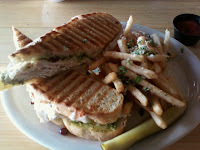 With it’s roast turkey breast, smoked provolone, pesto sauce and dried cranberries this sandwich didn’t disappoint. The menu is too large to add into this post with pizzas, sandwiches, Panini’s, salads and deserts so you have to trust us and make it point to visit soon. The Grinder is a must have. Maybe I'll pass by there on Monday.